It is also proposed to introduce Tourist package for the pilgrims visiting Dwaraka Tirumala by linking up the following temples which are situated with in a radius of 35 Kms from Dwaraka Tirumala. A). Sri Bramaramba Malleswara Swamy Temple- Sri Konda Malleswara Swamy Temple: The temple of Sri Konda Malleswara Swamy is at a distance of 1 Km to the North-West of the main temple. The footpath leading to this Saivait temple is in a Sepant form and reminds the Serpant for the mountain. B) Sri Renuka Devi (Kunkullamma) Temple: This temple is on the main road leading to the village, at a distance of 1 K.M. towards south. C) Sri Anjaneya Swamy Temple: This is a small temple near the Siva Kalyana Mandapam. D) Sri Subramanyeswara Swamy Temple : This is a small temple near the bathing ghat, dedicated to Sri Kumara Swamy or Lord Subramanya. Sri Venkateswara Swamy, Anjaneya Swamy and Malleswara Swamy Temples, Mylavaram, Krishna District. Sri Venkateswara Swamy and Santhana VenuGopala Swamy Temple situated at Lakshmipuram, Dwaraka Tirumala Mandalam, W.G.Dist. Sri Bhooneelasametha Satyanarayana Swamy Temple, Sri Venkateswara Swamy Vari Temple, Sri Padmavathi Ammavari Temple, Rangapuram, W.G.Dt. Sri Seetha Lakshmana Hanumathsametha Sri Ramachandra Swamy Temple, East-Yadavalli. Sri Chennakesava Swamy Vari Temple, Sanivarapupeta, Eluru. Sri Kodanda Rama Swamy Temple, Kotha Nagulur, Reddygudem(M), Krishna Dt. Sri Kodanda Ramalayamu & Sri Venkateswara Swamy Temple, Bhatlamagutur, W.G.Dt. Sri Laxmi Narasimha Swamy Vari Temple, I.S.Jagannadhapuram. Sri Rukhmini Satyabhama Sameta Santana Venugopala swamy vari temple, Eastern Street, Eluru. Sri Arempudi Choultry, A. Annavaram, E.G.Dt. Sri Venkateswara Swamy Temple , Sri Anjaneya Swamy Temple, Sri Malleswara Swamy Temple and Sri Kota Mahalaxmi Ammavari temple, Mylavaram, Krishna Dt. *Saswatha Gotranamarchana: On payment of Rs.5,116/- one can have the permanent worship yearly once (Date/Thidhi) on their Name and Gotram in any one of the above temple at Mylavaram. 4) Sri Bhooneelasametha Satyanarayana Swamy Temple, Sri Venkateswara Swamy vari Temple, Sri Padmavati Ammavari Temple, Rangapuram, W.G. Dt. 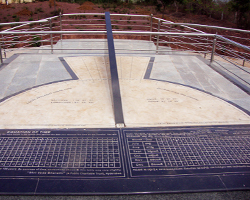 d) Sri SitaRamachandra Swamy Temple, East Yadavalli. f)Sri Laxmi Narasimha Swamy Vari Temple, I.S.Jagannadhapuram. 1. Sri Venkateswara Vykhanasa Agama patasala, Dwaraka Tirumala. 2. S.V. Junior College, Bhimadolu. 3. S.V. Junior College, Kamavarapukota. 4. Sri Venkateswara Oriental High School, Dwaraka Tirumala. Narasimha Sagar is a tank to the west of the village. This is alsocalled Swamyvari Pushkarini and Kumara Thirtha. 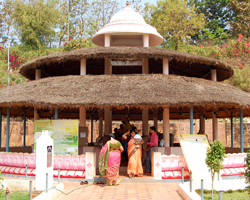 The bathing ghat to the north of this tank is called Chakrathirtha and that to the west of the tank is called Ramathirtha. The Kumaratirtha is the main bathing ghat for all pilgrims. This is a dependable source of water supply to the whole village. A dip in the holy waters of this tank is considered to be the most essential step to liberation and eternal bliss. 1. Kalyana Mandapam : A very spacious Mantapa in front of the Main Gopuram at the foot of the hill. 2. Vilasa Mandapam : On the main road to the south of Kalyana Mantapam. 3. Ugadi Mandapam : To the south of the village on the bank of Lingayya Tank. 4. Samkranti Mandapam : In a village called Dorasanipadu to the north of the hill on Makara Sankranthi day Lord Venkateswara goes round the Malleswara Temple. 5. Vijaya Dasami Mandapam : At the bathing ghat of the Narasimha Sagram.